Tickle My Senses: Mangalorean Style- Masala Fried Squid/ Calamari. This is one of my favourite Seafood. The piquant and heavenly aroma of frying squid with the meet mirsang/ chilli paste is enough to make me drool. The distinct aroma of the curry leaves used in this recipe is irreplaceable. The trick with calamari is to flash fry it, that is cook it on a high heat for a very short time. This brings out its lovely texture. Overcooking it makes it rubbery. Coconut /any other vegetable oil to fry. 3. Marinate cleaned squid with the paste for minimum 10 minutes to maximum 1/2 hour. 4. To fry: In a hot tawa heat sufficient vegetable or coconut oil ( 3-4 tbsps) . 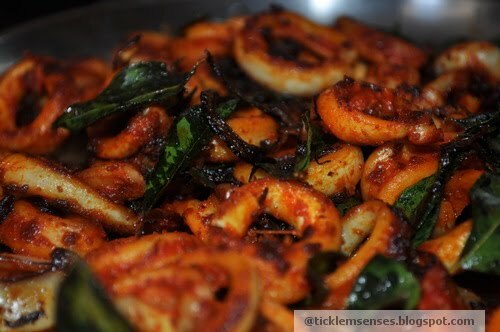 Place onion and curry leaves into the oil and fry till onion turns golden brown. Then turn up the heat to high and carefully add the squid in a single layer over the top of the onions, toss the squid about on high heat for a minute or two till just done. (Add more oil as require to prevent the masala burning). As soon as the squid starts turning appearance from translucent to opaque/white, it is done. Take off the heat. Overcooking will make the squid rubbery. Masala fried squid is ready. Serve along with drinks or as an accompaniment with rice and Daalisosaar. I tried this dish today. Marinated squid for 6 hrs as I had no time to cook it earlier. A lot of water came out of the squid when I was frying it and it got boiled rather than fried. I used one pound of squid for this recipe and it came out very spicy. I also tried the cockels which were delicious. How do you think the squid would be with mustard, garlic and coconut added to this recipe? * A lot of water came out of the squid when I was frying it and it got boiled rather than fried. A= This could happen if the the pan is crowded with too much squid at the same time/ or the temperature of the oil is not high enough. The next time you fry squid..make sure the oil is really hot, and the squid is laid in a single layer flat in the oil. 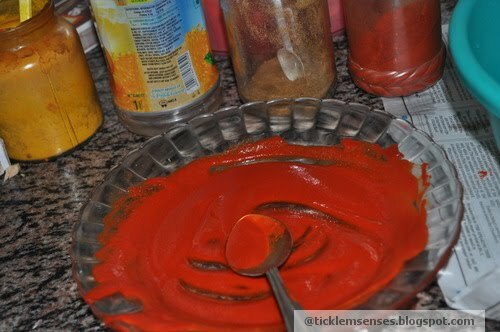 A- The chilli powder I use is Kashmiri chilli powder which has minimal heat/spice and good flavour and colour. I usually get this chilli powder from India as I dont find it in the UK. Most other chilli powders tend to be very hot/spicy in tiny amounts. If you cannot find the Kashmiri chilli powder you could try substituting with paprika powder with a few pinches of your chilli powder for heat. *How do you think the squid would be with mustard, garlic and coconut added to this recipe? Here are my modifications to the recipe. There is NO MARINATION involved but the dish needs to be made one hour in advance. I cook the masala and squid separately. Drain the squid and Microwave the squid rings on high for 2 mins till the squid rings turn white. If 2 mins is not enough to cook the squid completely, it helps to keep microwaving a minute at a time till completely cooked. DON'T OVERDO IT! Drain the squid rings and RESERVE THE LIQUID. 1. Add one Tbsp of coriander powder (dhaniya) to the meet mirsang masala. Also I use about 1tsp of salt. 2. Fry about 8 stalks of curry leaves in oil till they stops spluttering. Remove the fried leaves and keep aside. 4. Add the chopped onion, fry well. add the meet Mirsang paste along with the squid liquid. Cook well till semi dry. 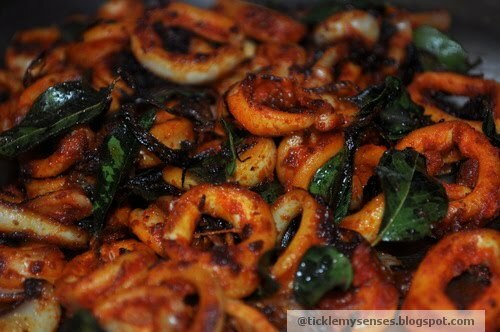 Add the squid rings to the paste along with the fried curry leaves. Mix well and turn off the flame. Let the squid rings absorb the masala for about an hour. Voila, super tender squid in a traditional curry. ENJOY! Simple Hot and Spicy Beef Curry! The Express Way! Spicy Chilli and Thyme Lamb Chops. Mangalore Style Hot Pepper Chicken.